During the early 1990s the community feed-back division of the Alzheimer’s Research Foundation noticed an odd phenomenon; they were receiving more complaints about Funeral Homes than about Nursing Homes! Anyone familiar with senior issues can appreciate how this stood out in the minds of those tasked with monitoring AD patients in their day-to-day lives. At first it was a mere curiosity. Then the ‘last straw’ came. A woman in Houston, Texas, who had nurtured her husband for over 7 years of the daily hell that is Alzheimer’s called to report that her husband had died, so his file could be closed. She also mentioned that she’d just come from the funeral home and that she’d taken along her husband’s papers, including his lone life insurance policy. The policy had a death benefit of $12,000 and — hardly a coincidence — the funeral home had charged her $12,000 to the penny! This seemed to be heartless greed and set the wheels in motion. Armed with a small grant, a nationwide study of the funeral industry was begun, with an eye toward producing an article or two suitable for Alzheimer’s-related newsletters. Soon it became apparent that such greed is pandemic in the self-styled ‘Death Care Industry’. Interviews with casket manufacturers revealed very reasonable prices for their wares, to the funeral homes. That cost was amplified 300% to a whopping 1400% in mark-ups to the public, however, a clear sign that greed was the motivating factor. This is more evident once one learns that the funeral home’s ‘non-declineable fee’ — or Basic Fee For Professional Services it is sometimes called — covers all the funeral home’s overhead AND a reasonable profit — yet the customer receives no goods or services in return for paying this fee! Interviews with over 700 (currently over 1,000) former employees of the funeral/cemetery industry revealed a pattern of sales ploys, disinformation, manipulation, and outright scams routinely perpetuated on families while they are in their most vulnerable state. 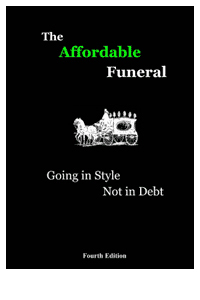 This information was codified in Dr. Markin’s book, The Affordable Funeral: Going in Style, Not in Debt, with exerpts cited on this web site. Our aim is not to disparage the death care industry but rather to educate the public as to their rights, options, and resources. Hopefully you will gain some valuable insights and learn to protect your family’s assets when the time comes, and it will come… for us all.